The massive economic growth rate of 24% which the International Monetary Fund predicted is no more. That was the Fund's figure for 2021, when gas production had been expected to begin. However, on 4 October, after its recent mission to Maputo, it revised that figure down to just 6.8%. Amid an unfavourable global environment and a severe economic crisis at home, Mozambique faces delays, disheartened foreign investors and a weakened bargaining position vis-à-vis the oil companies. Compounding these problems, the extraordinarily wasteful management of state finances by the Frente de Libertação de Moçambique (Frelimo) leaves many observers sceptical that the government will really ensure that the gas benefits are shared out among the population. Almost 55% of people live below the poverty line, a figure that has not changed for over ten years despite impressive economic growth. The overall picture darkened further at the beginning of this month when the well regarded Mineral Resources and Energy Minister, Pedro Couto, was removed under the influence, we hear, of the Frelimo old guard. Delays to major gas projects in the Rovuma Basin mean that gas production is now expected to start in 2023 at the earliest. Final investment decisions are overdue and projects have been losing momentum, with the US company Anadarko, which controls the Area 1 block, having largely decamped as it waits out the tough times. Yet while Anadarko is still to finalise its agreements with off-takers, Italy's ENI (Ente Nazionale Idrocarburi), which controls the Area 4 block, took an important step towards production on 4 October when it signed a 20-year sale-and-purchase deal with BP. It means ENI has secured customers for the gas produced by its Coral South Floating Liquefied Natural Gas (FLNG) facility – predicted to produce over 3.3 million tons of LNG a year – and can then make its final investment decision later this year. With oil and gas prices currently low, BP has also got a good deal but it could mean lower revenue for the government during the period of the agreement. Taking into account the costs which the companies are entitled to recover and the project-related debt repayments to be made by the cash-strapped state petroleum company, the Empresa Nacional de Hidrocarbonetos, profits for the state will be negligible. Furthermore, ENI's FLNG project will inject little fresh investment overall into the heavily indebted country (AC Vol 57 No 10, Secret security debts devastate economy). The FLNG is to be constructed abroad and the offshore facility, once operational, will have little impact on the local economy. Where government will see revenue is from profits and tax, which can be ploughed back into investment in development. These benefits will not be immediate, though. The biggest hope of making money from gas comes from the onshore LNG project managed by Anadarko. However, the company's activity has slowed considerably. After its country head, John Peffer, was relieved of his nine-year position in June, the company hired a new team to finalise sales of the gas, for which it has so far secured only non-binding agreements. John Bretz is now in charge. During his visit to the USA from 14-17 September, President Filipe Nyusi tried to pressure Anadarko to start preliminary work on the onshore project, namely relocating the population of the Afungi Peninsula where the project is sited. This early work had been expected to bring in up to US$400 million, helping to relieve the severe shortage of foreign currency. Anadarko has, we hear, promised to begin the process but observers say it will start in the first quarter of 2017 at the earliest. The delay is due to disagreements, among other factors, between the government and the company over the LNG terminal, say sources close to the talks. The government wants to place a commercial port close to Anadarko's dockside facility in order to benefit from any ancillary spending by the oil company. The company objects because the presence of commercial vessels in the narrow channel that leads to the open sea would hinder the LNG operations. Minister Couto was not part of Nyusi's US delegation and was relieved of his post shortly after the visit. Some say he was 'too honest', for which he has a track record. His replacement, Leticia da Silva Klemens, has been greeted with disappointment. She is widely seen as lacking relevant experience and beholden to the interests around General Alberto Chipande and ex-President Armando Guebuza. The development is regarded as a victory for those in government who see themselves as entitled to personal benefits from the gas (AC Vol 57 No 6, Nyusi's resolve in doubt). Oil giant Exxon's purchase of a stake in ENI's Area 4 licence is an important development. Despite reaching a framework agreement this summer, there are still some points to be agreed, we hear from Ministry sources. Much uncertainty remains over this long-rumoured acquisition, with both Exxon and ENI remaining characteristically tight-lipped, but we understand the deal is effectively done. Rumours are rife about whether Exxon will also buy into Anadarko's Area 1 asset. Talks have taken place in Houston, Texas, site of Anadarko's headquarters, industry sources told Africa Confidential. Anadarko told the government during Nyusi's US visit that it was committed to staying but many are sceptical over whether it will be able to finance the project, especially with lenders wavering in the wake of the government's hidden debt scandal and the consequent economic damage. 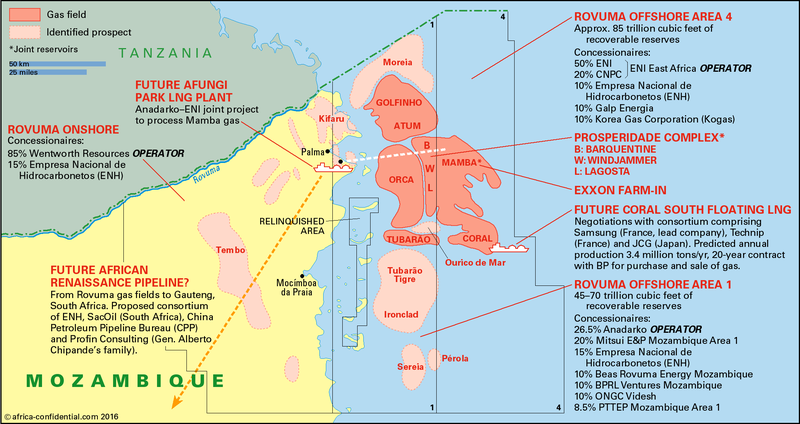 If Exxon takes a significant stake in ENI's Mozambique assets, that could have an impact on Anadarko's LNG project as ENI and Anadarko have been planning to work in partnership. A new partner may want to review the planning, resulting in further delays. The government gave its preliminary blessing to the sale of a stake in Area 4 to Exxon following the July visit by Exxon's Chief Executive Officer Rex Tillerson, when he met Nyusi in Maputo. There is much talk that Exxon will focus on ENI's onshore assets rather than the FLNG. To be able to split the block in this way, there would need to be a specific legal arrangement. Sources close to Exxon say that it wants to buy a stake in ENI East Africa, rather than the block the company leases, giving it greater flexibility. The capital gains tax that should arise from the Exxon-ENI deal is much anticipated, with figures as high as $1.3 billion circulating. The high figure presumes Exxon will buy both ENI and Anadarko's assets; $400 mn. looks more realistic. In 2013, when ENI sold a 20% stake in ENI East Africa to the China National Petroleum Corporation for $4.2 bn., the country received $400 mn. in taxes. Since then, the world price of gas has halved. Ironically, it was the promise of vast and easily obtainable riches from these large gas deposits that encouraged Guebuza's government to sanction the secret borrowing of $2 bn. for ill-planned, unrealistic projects. They have left the country saddled with additional debt equivalent to over 11% of gross domestic product. The conventional wisdom, which the IMF supports, has been that a country such as Mozambique should invest its gas revenue in projects that would help its economic development and provide immediate benefits to the population, rather than following the Norwegian model and saving up the profits. However, in a state so lacking in accountability and transparency, being told that billions of dollars will pour in and being given a green light to spend them has been a recipe for disaster. Political influence is key to commercial success in Mozambique and the government wanted to make sure it took its cut while it could. In doing so, it mortgaged the country at too high a price. Now it is realising that the gas will not be the golden ticket that it once imagined and its actions have set back the sector's development. Prepared for Free Article on 23/04/2019 at 03:21. Authorized users may download, save, and print articles for their own use, but may not further disseminate these articles in their electronic form without express written permission from Africa Confidential / Asempa Limited. Contact subscriptions@africa-confidential.com.